I'm there on saturday, can't be there for the actual race dammit. I'll call you when I arrive and meet you at the paddock Keith. No Problem, My first race is after lunch, so quite late ? Are you in races 25 and 36 on Sunday? Are you running with the new front calliper this weekend. Keith do you still have the 350lc front and rear end? I haven't got a spare LC front end as I have now almost finished the candy blue 250. how the race bike coming on mate ? Thought you had an RGV front and a Metchamex rear? Maybe I was daydreaming lol. Race bike slowly taking shape I am going to pop up some new pics later on. Gutted, I can't make Lydden this weekend. Should be a good weekend as the weather looks a bit more settled for the next couple of days. Have a good one Keith. 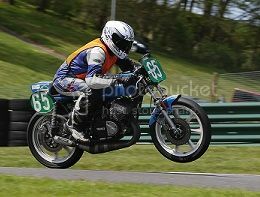 CRMC racing at Snetterton this weekend featuring race of the year on Sunday. Practice is on the Friday and the weather is looking kind. So engine out and full re build ready for Saturday racing. Thanks for the report Keith. Keep it going mate, see you later in the year.